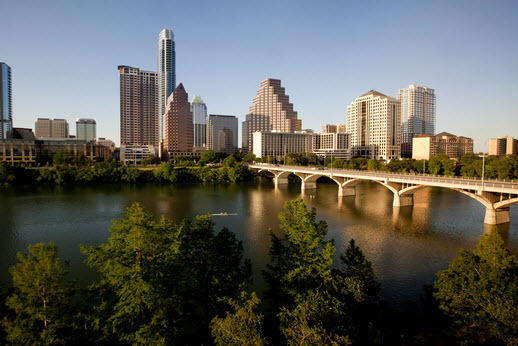 Austin TX real estate is located in a historic and diverse city situated in an idyllic area of the Texas Hill Country. Central Austin real estate, for example, hosts numerous condo complexes, single family homes and suburban communities, nicely removed, but not far from all the action. Austin TX real estate showcases numerous, beautiful neighborhoods and a wide array of homes all around the metro area. Tarrytown homes for sale, for example, appear beside Lake Austin, attracting discerning buyers with upscale options and various levels of luxury. Available Tarrytown homes include lakefront estates. Westlake homes for sale also attract plenty of attention for their location on the other side of Lake Austin, amid tranquil, tree-dappled grounds and upscale appointments. Wherever homes for sale in Austin appear, a family-friendly, close-knit feel seems to accompany them. Plenty of conveniences and top-rated schools, beautiful parks, green spaces, trails and recreational opportunities are in close proximity. In fact, Austin TX real estate comes brimming with quality, desirability, curb and price appeal. From cozy bungalows, condos and townhomes, to spacious single family homes, custom lakefront homes and countryside estates, those interested should expect to find many unique opportunities for living, working and playing in Austin. One of the best things about living in Austin TX real estate is all the wonderful events and attractions for all ages. The music scene is phenomenal in Austin. During the year, there are numerous music festivals worth checking out. These include Austin City Limits, Urban Music Festival, Fun Fun Fun Fest, Chaos in Tejas, South by Southwest and the Pachanga Latino Music Festival. For places to eat, drink and music, there is Red River, Sixth Street, South Congress, Rainey Street, East District and Downtown District. Each area exuding its own unique character. If being outdoors is more your thing, Austin has plenty of outdoor recreational activities as well. Whether you enjoy hiking, cycling or water sports, such as canoeing, paddle boarding, and boating, you’ll find it in Austin. The Lady Bird Lake Hike and Bike Trail is Austin’s crown jewel. The Barton Springs Pool are also another great place to catch some rays. These natural springs are perfect for the whole family. There are even events hosted here such as Splash Party Movie Nights. Austin is also known for its delicious eateries. Check out places such as Moonshine Patio Bar & Grill, County Line on the Hill, LA Barbecue, Oasis, Torchy’s Tacos, Juan in a Million, East Side King, Gourdough’s, El Sol Y La Luna and many more. There is also ample shopping in Austin including San Marcos Premium Outlets, The Texas Clothier, Waterloo records, Barton Creek Square Mall and The Domain among others. Austin TX real estate is an amamzing place to call home. This is a vibrant city great for raising a family or for young professionals. With so many housing types and subdivisions, you’ll find something to suit your lifestyle. Contact McNabb and Co for a more information about homes for sale in Austin at 512-667-9129 . Find Homes for Sale in Austin, Real Estate and Lifestyle Info.